Crews used a 100-ton crawler crane for the basement cast-in-place concrete structure, and a 350-ton crawler crane for the structural steel erection. A $250 million mixed-used project known as Texas Live! 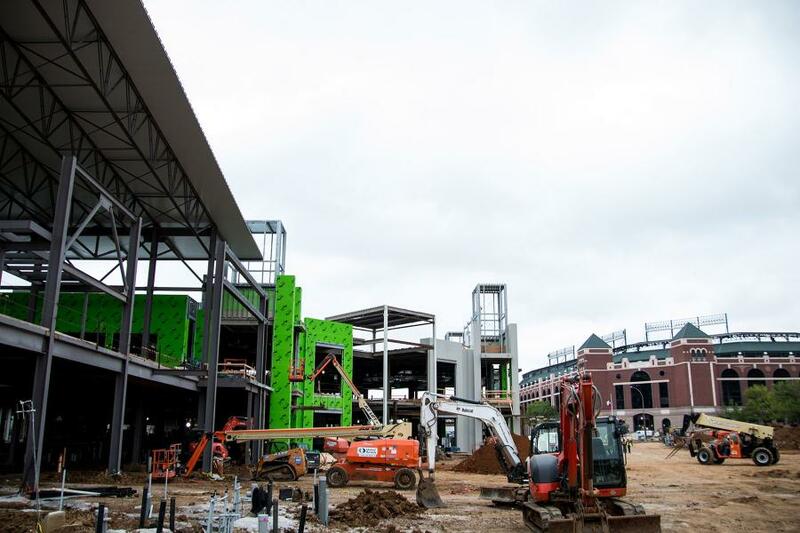 is expected to attract as many as three million new visitors to the Arlington entertainment district when it opens later this year. Developed in partnership among The Cordish Companies, the Texas Rangers and the city of Arlington, it will feature in excess of 200,000 sq. ft. of dining and entertainment space over two levels, including an outdoor event pavilion. “The district will be a gathering place for the local community, as well as visitors, near and far,” said Cari Furman, spokesperson of The Cordish Companies. The world-class dining, entertainment and hospitality district is situated between the Texas Rangers' Globe Life Park and the Dallas Cowboys AT&T Stadium. 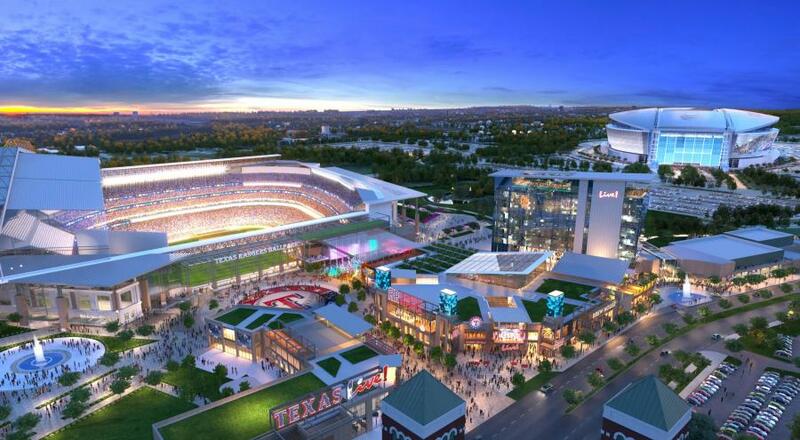 The project is part of a $1.25 billion vision for the stadium district that features a new Rangers ballpark, 200,000 sq. ft. of best-in-class restaurants, retail and entertainment venues and a full-service convention hotel. Among the venues will be Rangers Republic, a clubhouse for fans during home games, away games and throughout the year. A celebration of the team's heritage past, present and future, Rangers Republic will be a two-level, 30,000 sq. ft., family-friendly dining and entertainment venue that will allow fans unprecedented access. Live! Arena is being constructed as a multi-level, central gathering place featuring more than 35,000 sq. ft. of best-in-class dining and entertainment options. 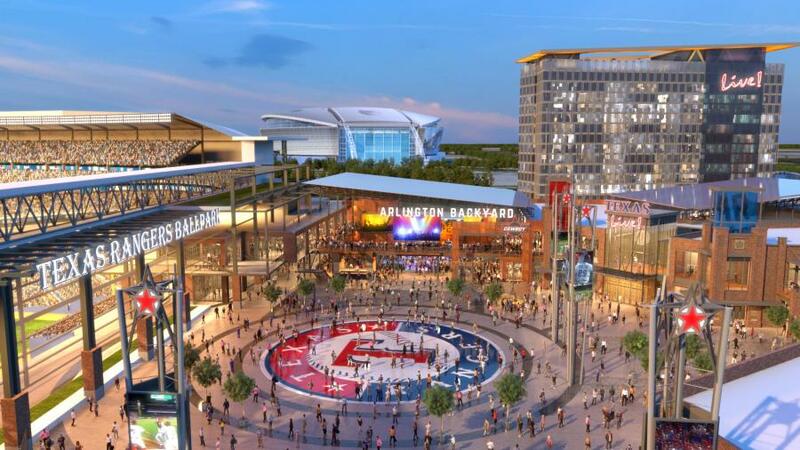 It will reportedly provide fans with one of the best sports viewing experiences possible and will be a place to celebrate the Rangers and all Texas sports. Arlington Backyard is a 5,000-capacity outdoor event pavilion that will host more than 250 annual events, including cultural activities, art shows, regional and national concerts, charitable functions and community events. It also will serve as the launching point for major festivals throughout the entire district. Furman said joining with a high-profile baseball organization has been a rewarding experience from the start. The Cordish Companies, a fourth-generation, family-owned operation headquartered in Baltimore, viewed the project as a perfect fit. A highly-anticipated, new hotel will offer 300 rooms, with plenty of meeting space. Designed by HKS Architects, the 14-story tall structure will feature unique spaces for events and entertainment, including Tower Terrace. Located within a 40 by 60 ft. veranda-style cutout through the hotel tower, the terrace will serve as the hotel's central gathering place to relax with family and friends. Another space, Event Lawn, will serve as a venue for weddings, special events and community gatherings. Located adjacent to the Tower Terrace and directly next to the Event Lawn, guests will be able to enjoy the same views of the entertainment district from the pool area, as well as the immersive audio/visual experience. The resort-quality space will feature two bars, including a swim up bar, as well as rentable private cabanas, lounge space and a fire pit. The rooftop terrace will feature several private rooms, as well as a central main space for private functions and events. The two-story, 35,000 sq.-ft. Grand Event Center will include a glass facade with dramatic views of the entertainment district. The meeting, event and convention space will include a grand ballroom with banquet seating capability up to 1,500; an executive boardroom with five additional meeting rooms; pre-function space; and a 1,500 sq. ft. outdoor terrace overlooking Johnson Creek and the entertainment district. Manhattan Construction Company is serving as the general contractor on the project, where work is continuing at a steady pace. 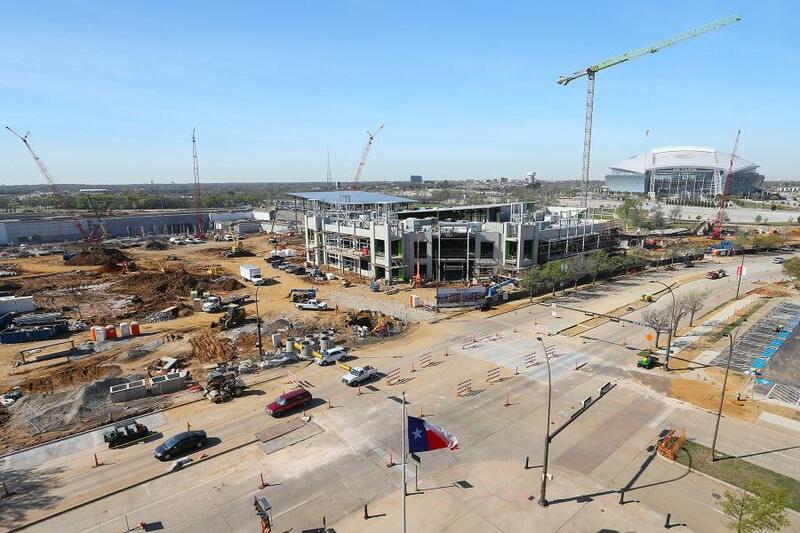 “One of the biggest challenges is coordinating all construction activities with events at AT&T Stadium, home of the Dallas Cowboys, and Globe Life Park, home of the Texas Rangers,” said Ryan Carter, Manhattan Construction senior project manager. Work on Texas Live! began in March 2017 and is expected to be complete by late summer 2018. It is currently approximately 60 percent complete. Construction of the exterior façade, which includes brick, stone, metal panels and glass & glazing, is ongoing, as is the interior MEP overhead/in-wall rough-in and interior framing. The cast-in-place basement structure, structural steel framing and exterior sheathing is already finished. As far as key tasks yet to be carried out, “We are focused on completing the exterior façade, MEP systems and all interior finishes,” said Carter, who added that the condition of the property before work began presented some issues. Significant excavation was required to facilitate the cast-in-place basement component. Crews used a 100-ton crawler crane for the basement cast-in-place concrete structure, and a 350-ton crawler crane for the structural steel erection. A variety of materials are being used during construction, with the exterior façade composed of brick, cast stone, stone, metal panels and glass and glazing. Weather also has been a factor during construction. For baseball executives, the project is the perfect complement to the new stadium. According to Arlington Mayor W. Jeff Williams, the project is another significant investment in an Arlington economy that already has tremendous momentum. “This state-of-the-art development will expand the city's ability to host even more major events and conventions. We greatly appreciate the Texas Rangers' continued investment in our community and we applaud their selection of The Cordish Companies, the premiere mixed-use developer in the country, as their development partner. As work continues on Texas Live! crews also are making progress on the new 1.7 million sq. ft. ballpark, located on 13 acres just south of the current Globe Life Park in Arlington. The stadium will include a retractable roof for climate control and shelter for fans during the humid summer months. Seating capacity for Globe Life Field is expected to be roughly 40,000.